DTC Picks Verdu For Registrar….Teamster Drivers At Coke On Strike Over Health Premiums…..Donovan HQ opens in New Britain…. Juan Verdu, a former Board of Education President, has been unanimously endorsed for Democratic Registrar of Voters for the November 6th Presidential Election. Verdu’s endorsement came at the May 29th Democratic Town Committee meeting at City Hall when Democrats completed a slate for legislative offices and Justices of the Peace. 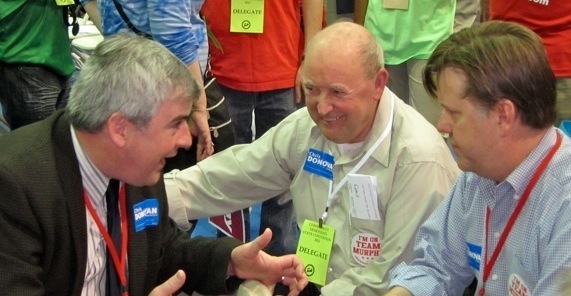 Juan Verdu (center) with Mayor Tim O’Brien and DTC member Peter Kochol at the May 12th Democratic State Convention. Verdu was endorsed for Registrar of Voters May 29th. DTC members from the 25th and 26th State Assembly Districts also re-endorsed State Rep. Bobby Sanchez and State Rep. Peter Tercyak for re-election. Previously, Verdu served on the board of education for eight years serving as its president, vice president and chair of the board’s finance committee. He is a past officer of the Spanish American Cultural Club and has been active on numerous voter registration drives and Democratic campaigns. Professionally, Verdu has worked at the Human Resources Agency HRA as an eviction and foreclosure mediator. Verdu also served on the statewide Blue Ribbon Commission To Study Affordable Housing. Multi-term Registrar Edward “Butch” Dzwonkowski is not seeking re-election to the office for a four-year term. Verdu was nominated by State Rep. Bobby Sanchez and State Central Committeewoman Emma Pierce. In conjunction with the Registrar endorsement, the DTC is forming a Voter Registration task force in the run up to the November election in coalition with other community organizations to boost turnout for the August 14th Primary and November 6th General Election. A strike by 335 Teamsters members — Local 1035 — at the East Hartford Coca-Cola bottling plant, which began May 17th, continues with no talks scheduled to resolve a contract dispute that involve the bottler’s effort to add health insurance costs to workers who deliver Coke products to stores throughout the region. The union members, according to press reports, previously agreed to give up $2.65 in hourly raises over the last five years to avoid getting hit with the insurance premiums. The company acknowledges it put $11 million into the Teamsters health care fund over the last five years as the result of the wage giveback but now denies a linkage with health coverage in its desire to assess withholding on workers to pay for health insurance. Both U.S. Senator Richard Blumenthal and Cong. Chris Murphy (D-5) joined the picket line on May 25th amid calls by union leaders for a boycott of Coca Cola products because of the labor dispute. Endorsed Congressional candidate Chris Donovan opened local campaign headquarters across the 5th district on Saturday, June 2nd, and was joined by DTC members and leaders at the New Britain HQ at 19 Bassett Street in a morning visit. 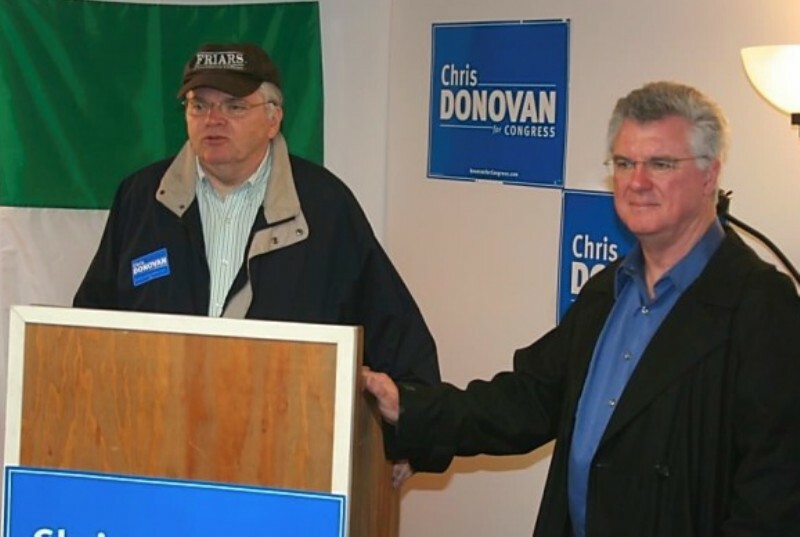 DTC Chair John McNamara introduces Chris Donovan at NB headquarters Saturday. The New Britain DTC endorsed Donovan in his Congressional bid in February and the Meriden Democrat received the unanimous support of city delegates at the May 14th Congressional convention, which he won with more than 65% of the convention. For information and to volunteer for the New Britain Donovan campaign interested persons may call 860-505-8901. 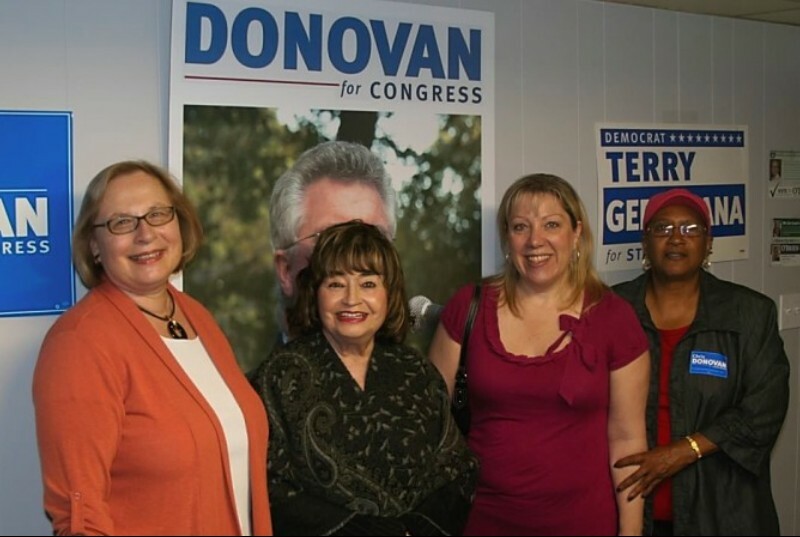 On hand for the opening of Donovan for Congress headquarters Saturday were from left State Senator Terry Gerratana, Harriet Geragosian, City Treasurer Teresa Sapieha-Yanchak and Ward 3 Alderwoman and Black Democratic Club President Shirley Black. This entry was posted in Chris Donovan, Election Day, Rock The Vote, Weekend Update. Bookmark the permalink.